Pema Chödrön shows us how to shed our emotional armor and open to limitless love. Have you ever wanted to love and connect with others more deeply … but felt that you could use a little help shedding the “emotional armor” and opening your heart? 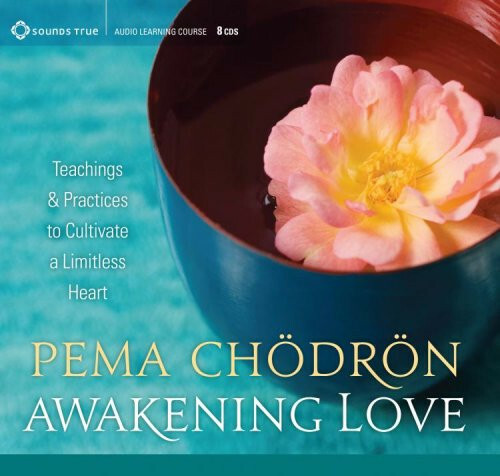 With Awakening Love, Pema Chödrön invites you to start wherever you are, amid any and all of the challenges, frustrations, or fears you may be facing, and to use them as the starting place to awaken the natural and boundless capacity to give and receive love more fully. This practice-centered program, recorded at Gampo Abbey, will teach you how to apply the insights of Buddhism’s Four Limitless Ones—lovingkindness, compassion, sympathetic joy, and equanimity—to even your most difficult obstacles. Here, Pema Chödrön brings her unique blend of kitchen-table common sense, scholarship, and empathy to help you discover the eternal resilience and joy of your own tender, undefended, and genuine heart. Whether you’re in the midst of a challenging relationship, grief, or simply in need of heart-centered rejuvenation, Awakening Love provides you with the gentle step-by-step instructions needed to awaken the natural goodness within you. a great teacher ! ! ! Pema is wonderful. She isn't one of these "high above everyone else" gurus. She goes through the same issues we all go through and presents material in a sweet, loving, yet sometimes funny way. Everything went smoothly. I love your company and the material you make available, many for free.